RED DEER, ALBERTA (September 22, 2016) – After launching his car racing career with a solid rookie season in the Cooper Tires USF2000 Championship Powered by Mazda in 2015, rising Canadian open wheel formula car star Parker Thompson returned to the first rung of the Mazda Road to Indy this year and certainly made a name for himself. All eyes are now on the 18-year-old from Red Deer, Alberta after he scored four wins, led the series in podium finishes and most laps led, and came up just short of winning the championship. Parker continued to develop his racecraft, he showed poise and maturity beyond his years and, with another year of quality experience under his belt, he can look back at 2016 as an extremely positive step in his career. Parker scored his first career USF2000 victory in the opening race at Barber Motorsports Park in Birmingham, Alabama in April, and followed that triumph with a win in the second race of the doubleheader to sweep the weekend. He made a huge statement with the dominant performances, putting his name at the head of the class as one of the true up-and-coming young drivers in the sport. The 18-year-old backed up his first wins very quickly, garnering his third checkered flag during the series’ trip to the most famous racecourse in the world, the Indianapolis Motor Speedway. Parker won on the facility’s road course, adding his name to the track’s prestigious history books. Thompson’s final win of the year was his most special, as he stood on the top of the podium at the Toronto Indy, scoring the victory on his home soil in Canada. Winning in his home country was an incredible feat and a tremendous moment in Parker’s young career. 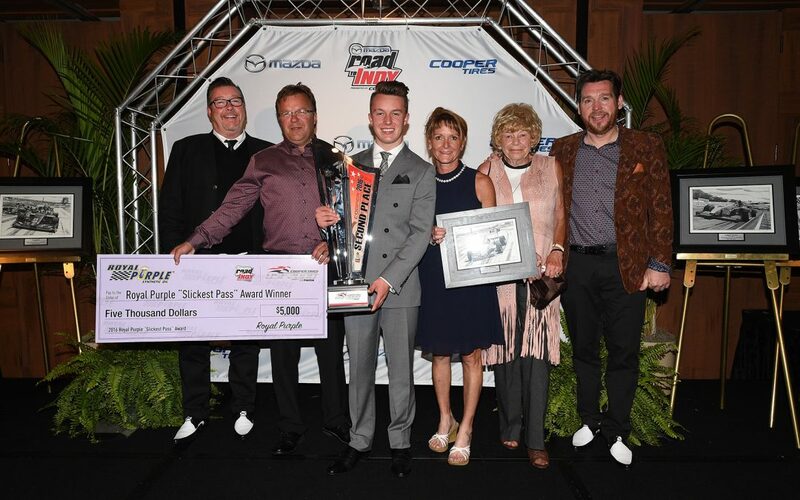 At the season-end awards banquet, held in Monterey, California, Parker was honoured for several achievements, beginning with his position as the 2016 Cooper Tires USF2000 Championship Powered by Mazda Vice-Champion. En route to this result, Thompson scored the most podiums with 12 and led the most laps of all drivers (137). Thompson was also awarded with the Royal Purple Slickest Pass Award thanks to his daring overtaking maneuver on teammate Anthony Martin at Toronto where he drove around the outside of the leader heading down the long backstraight on Lakeshore Boulevard. It was a stellar season for the young Canadian, who is aiming for a career in the Verizon IndyCar Series. Parker’s season is not quite finished, however, as he was recently selected to represent his country as the driver for the Team Canada Scholarship program. Thompson will travel to England to compete in the world-renowned Formula Ford Festival at the iconic Brand Hatch in late October. Parker is thankful for the opportunities provided to him by his valued partners, including Weyburn Energy, Uber, Sylvan Lake RV, Bell Helmets, OMP Racing, Lapizta Watches, Openhwy, Mazda and Cooper Tires.